It’s NFL Draft day, and football fans across the country are glued to their televisions, computers and smart phones, anxiously awaiting the news that could make or break their team’s upcoming season. The interesting thing about this year’s NFL Draft is the lack of a clear “sure thing” choice for any of the 32 teams down the pick lineup. Over the past month, the Web has been littered with mock drafts, predicting where players will land, only to end up crossing their names out and switching them up again. Many talented prospects won’t receive a call at all during the three-day, seven-round event. The long list of talent this year far exceeds the 254 total picks that will make up the 2013 draft class. Hoping to lock down two of those spots are safety Kenny Vaccaro and wide receiver Marquise Goodwin out of the University of Texas. ATLX tapped our expert Jeff “Mad Dog” Madden for insight on the training regimen of the two athletes. Madden is the Assistant Athletic Director for Strength and Conditioning at the University of Texas and has worked closely with Vaccaro and Goodwin on a daily basis since they were freshmen. Goodwin, a 5 foot 9, 183 pound Olympic long-jumper, clocked an official 4.27 40 at the NFL combine, making him the fastest prospect there. Unofficially, the slot receiver ran a 4.25, matched only by West Virginia standout Tavon Austin. Speed is clearly Goodwin’s x-factor — he’s been compared to lightning fast receiver Mike Wallace down the field — but analysts knock him for his size. “He had to keep himself at a certain weight for jumping and trying to win the Olympics,” Madden said in Goodwin’s defense. Training as a two-sport athlete at the University of Texas year-round, Goodwin controlled his weight based on the season. The word Madden used most often to describe Goodwin? Electrifying. He emphasized Goodwin’s role on the team, saying, “We’d get fired up every time he came back from summer track to train with us. We thought our team was fast until he joined it. He was so much faster than anybody else.” Just like the height Goodwin gets docked for, speed isn’t something you can teach either, Madden noted. Still, his size has kept him off many mock draft radars. His strength and conditioning coach’s response was one of confidence. “He’s tough enough, he’s physical enough, he’s strong enough to get it done,” Madden said. “I’m just looking forward to him showing the whole country what he can do.” Madden praised Goodwin for his work ethic, saying he would be an invaluable addition to any team, given the chance to prove his size doesn’t hinder his game. Vaccaro’s draft projection is less uncertain. Considered the best safety in the 2013 NFL Draft, he’s likely to go quickly in the first round. With analysts comparing him to players like Ed Reed and Troy Polamalu, and his own coach throwing Michael Griffin and Michael Huff into that mix as well, Vaccaro is expected to be a Pro-Bowl caliber DB. Madden has no doubt Vaccaro will be a solid NFL contender, citing not only his athletic ability, but his leadership as well. “He’s a professional, the way he carries himself every day,” said his coach. The projected mid-first round pick is known for his physicality and change of direction mobility. As a blitzer, he’s strong off the edge and has the upper body strength and hands to make plays. Unlike teammate Goodwin, speed isn’t one of Vaccaro’s strongest selling points. His 40 time of 4.63 makes his questionable ability to stay on quicker receivers downfield a criticism among draft analysts. Madden believes that the noted weaknesses for both Vaccaro and Goodwin aren’t enough to decrease their value as athletes. As their strength and conditioning coach, he’s helped them maximize their potential throughout their careers at the University of Texas. “They both have great work ethic,” Madden added. “Marquise trains year-round for two different sports. Kenny is year-round for football, spring and in-season. Both of them are excellent in the weight room.” As a freshman, Vaccaro weighed in at 185 pounds. He’s now 216. Goodwin, who went in on a track scholarship, was at least 20 pounds lighter before he began training as a Longhorn. 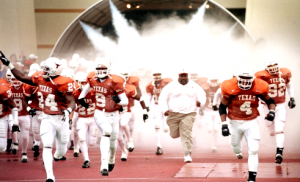 Madden emphasized that University of Texas football training is programmed to prepare players for the NFL from day one. “We train for all the different things they do at the combine on a weekly basis,” he said. They do a good job of it, too. The Longhorns rank third for most current NFL players with a program so elite that it draws them all back to Austin for off-season training. As far as Goodwin and Vaccaro go, Madden said he is confident their training has prepared them for the draft and for the league.